Mail-in Entry: Enter by submitting a letter with your first and last name, address, phone number and email address and mail in a self addressed stamped envelope to “WIN YOUR AVID Ascend GT PURCHASE Contest”, Yokohama Tire Canada, 500 9325 200 St, Langley, BC V1M A37. Mail-in entries must be postmarked by May 31st, 2019 and be received by the Sponsor by June 3rd, 2019 to be eligible. Each mailed-in submission will be entered in the Program’s database and will become subject to all terms and conditions of the Program. 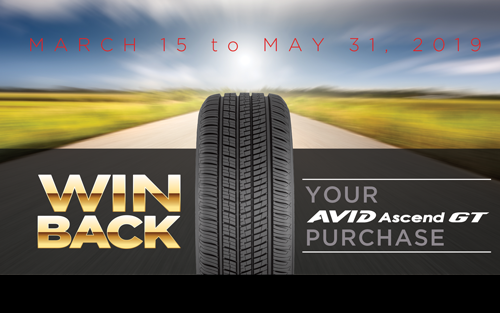 TIMING: On March 25, April 1, 8, 15, 22, 29, May 6, 13, 20, 27 and June 3 rd 2019, the winner will be awarded the ‘Weekly Prize’, a set of AVID Ascend GT tires, value of $1000. Yokohama shall select a winner from the entries submitted that meet the rules requirements described below. By submitting the entry into the contest, entrant agrees to the rules of contest and states that they are 18 years of age or older. Winners of this contest cannot win more than one weekly prize. PRIZES. Prizes will be awarded as described below. Terms and conditions may apply to the Prize. Prizes are provided “as is” and without any warranty of any kind. Prizes are non-transferrable. No cash redemption or prize substitution allowed by winner. Sponsor reserves the right to substitute Prize of equal or greater value if advertised Prize becomes unavailable. WEEKLY PRIZES: Eleven (11) Weekly Prize winners will each receive a cheque of $1000. SELECTION OF WINNERS AND AWARDING OF PRIZES. On March 25, April 1, 8, 15, 22, 29, May 6, 13, 20, 27 and June 3 rd 2019 Yokohama Tire Canada will select a random winner among all eligible entries. Sponsor will make all final decisions in any and all issues related to this Sweepstakes, and its decisions shall be final and binding in all respects. Yokohama Tire Canada will attempt to contact the winners by email. ELIGIBILITY: Contest open to legal residents of Canada who are eighteen (18) years of age and older at the time of the Contest. Employees and agents of Sponsors, and all affiliates, and each of their parents and affiliates, agencies, vendors, distributors, wholesalers and retailers, and members of such employees’ immediate families and individuals living in the same household with such employees, are not eligible to win. By participating, entrants agree to be bound by these Official Rules and the decisions of the judges and/or Sponsor, which are binding and final on matters relating to this Contest. Yokohama will determine winner’s eligibility. By entering the contest, except where legally prohibited, entrants grant permission for Sponsors and their designees to use his/her name, address (city and state), photograph, voice and/or other likeness, prize information as well as their entry photograph without further compensation, in all media now known or hereafter discovered, worldwide in perpetuity, without notice or review or approval as well as a royalty-free, non-exclusive license to display, distribute, reproduce, and create derivative works of the entries, in whole or in part, in any media now existing or subsequently developed, for any advertising, trade, publicity and/or promotional as well as all other standard Sponsor purposes. TAXES. Any valuation of the prize stated above is based on available information provided to the Sponsor, and the value of any prize awarded to a winner may be reported for tax purposes where required by law. Winner is solely responsible for reporting and paying any and all applicable taxes, if any. OTHER CONDITIONS. All federal, provincial and local laws and regulations apply. Sponsor reserves the right, at its sole discretion, to cancel, terminate, modify or suspend this Contest or any portion hereof, or to disqualify any individual implicated in any of the following actions, if for any reason: (a) infection by computer virus, bugs, tampering, unauthorized intervention, actions by entrants, fraud, technical failures, or any other causes which, in Sponsor’s sole opinion, corrupt or affect the administration, security, fairness, integrity or proper conduct of the Contest, (b) the Contest or any website associated therewith (or any portion thereof) becomes corrupted or does not allow the proper processing of entries per these rules, or (c) the Contest is otherwise not capable of running as planned by Sponsor(s). Sponsor reserves the right at its sole discretion to suspend, modify or terminate the Contest and, if terminated, at its discretion, select the potential winners from all eligible, non-suspect entries received prior to action taken or as otherwise deemed fair and appropriate by Sponsor. By entering, participants agree to release and hold harmless Yokohama all affiliates etc., subsidiaries, affiliates, divisions, advertising and promotional agencies, wholesalers and retailers, and each of the foregoing entities’ employees, officers, directors, shareholders and agents (collectively the “Released Parties”), from and against any and all claims, actions and/or liability for any injuries or death, loss or damage of any kind arising from or in connection with participation in and/or entry into the Contest or acceptance, use or misuse of any prize. The Released Parties are not responsible or liable for any incorrect or inaccurate entry information, whether caused by entrants, site users, tampering, hacking or by any equipment or programming associated with or utilized in the Contest and assume no responsibility for (i) any error, omission, interruption, defect or delay in operation or transmission at any website or phone line, (ii) failure of any entry to be received by Sponsor due to technical problems, human error or traffic congestion on the Internet, phone lines or at any website, (iii) communications line, hardware and/or software failures, interrupted or unavailable network, server, or other connections, availability or accessibility or miscommunications or failed computer, satellite, telephone or cable transmissions, lines, (iv) damage to any computer (software or hardware) resulting from participation in the Contest, (v) theft or destruction of, tampering with, unauthorized access to, or alteration of entries and/or entry information, or (vi) entries which are late, lost, incomplete, inaccurate, stolen, misdirected, undelivered, garbled, damaged, illegible, unintelligible and/or postage due (or any combination thereof). The use of third-party software or website or automated entry systems to participate is prohibited, and Sponsor reserves the right to disqualify entries made in such fashion. By entering, entrants agree to comply with these rules. Any entrant who attempts to tamper with this Contest in any way shall be disqualified. If the identity of an on-line entrant is disputed, the authorized account holder of the e-mail address submitted at the time of entry will be deemed to be the entrant. The individual assigned to the e-mail address for the domain associated with the submitted e-mail address is considered the authorized account holder. A selected entrant may be required to provide proof that he/she is the authorized account holder of the e-mail address associated with the selected entry. The sole determinant of time for the purposes of receipt of a valid entry or vote in this Contest will be the Contest server machine(s). DISPUTES. Entrant agrees that: (i) any and all disputes, claims and causes of action arising out of or connected with this Contest or any prizes awarded shall be resolved individually, without resort to any form of class action, and exclusively by the British Columbia Provincial Court located in Vancouver, British Columbia; (ii) any and all claims, judgements and awards shall be limited to actual out-of-pocket costs incurred, including costs associated with entering the Contest but in no event attorneys' fees; and (iii) under no circumstances will entrant be permitted to obtain awards for and entrant hereby waives all rights to claim punitive, incidental and consequential damages and any other damages, other than for actual out-of-pocket expenses, and any and all rights to have damages multiplied or otherwise increased. SOME JURISDICTIONS DO NOT ALLOW THE LIMITATIONS OR EXCLUSION OF LIABILITY FOR INCIDENTAL OR CONSEQUENTIAL DAMAGES, SO THE ABOVE MAY NOT APPLY TO YOU. All issues and questions concerning the construction, validity, interpretation and enforceability of these Official Rules, or the rights and obligations of the entrant and Sponsor in connection with the Contest, shall be governed by, and construed in accordance with, the laws of the Province of British Columbia, without giving effect to any choice of law or conflict of law rules (whether of the Province of British Columbia or any other jurisdiction), which would cause the application of the laws of any jurisdiction other than the Province of British Columbia. Yokohama Entities: Yokohama, its global subsidiaries, dealer network, vendors and each of their respective subsidiaries, affiliates, shareholders, officers, directors, agents, representatives and employees (collectively, “Yokohama Entities”) will have no liability or responsibility for any claim arising in connection with participation in this Contest or any prize awarded. The Yokohama Entities have not offered or sponsored this Contest in any way. RELEASE: By entering the Sweepstakes, entrants release, indemnify and hold harmless the Promotion Entities, Twitter, Inc., Instagram, LLC, and their respective subsidiaries, affiliates, suppliers, distributors, advertising/promotion agencies, and prize suppliers, and each of their respective parent companies and each of the foregoing’s officers, directors, employees, governors, agents, successors and assigns (collectively, the “Released Parties”) from and against any damages (including, but not limited to, personal injury, death, or damage to or loss of property), losses, liabilities, claims, demands, suits, proceedings, causes of action or costs and expenses (including reasonable attorneys’ fees), arising out of or relating to (a) entry, participation or inability to participate in the Sweepstakes or any Sweepstakes-related or prize-related activity, (b) acceptance, possession, receipt or use or misuse of any prize or any component thereof, including any travel related thereto or (c) the violation of any privacy, personal, publicity or proprietary right including any allegation that the entrant’s Photo submitted in this Sweepstakes infringes, misappropriates or otherwise violates any intellectual property right or other proprietary right of any third party. Promotion Entities make no warranties, and hereby disclaim any and all warranties, express or implied, concerning any prize awarded in this Sweepstakes. Without limiting the generality of the foregoing, all such prizes are provided "as is" without warranty of any kind, either express or implied, and Promotion Entities hereby disclaim all such warranties, including but not limited to, the implied warranties of merchantability, fitness for a particular purpose and/or non-infringement.